This article was originally published in the Living Lightly column of the Border Mail, 18th November 2015. 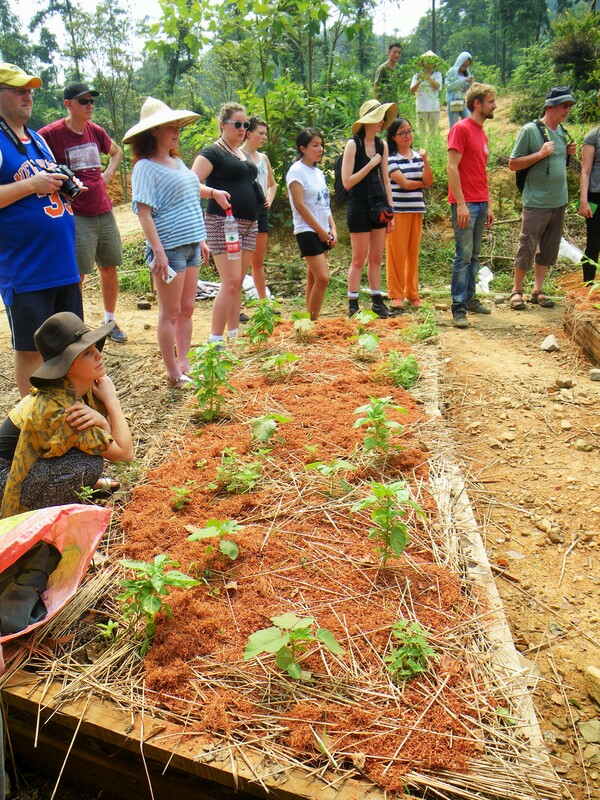 Members of my ‘Environment and Sustainability in China 2015 Study Tour’ group learning about raised garden beds at Hangzhou permaculture farm. From 13th-23rd July I led a group of La Trobe University students on a study tour to Shanghai and Beijing in China. Among our tour group were Albury-Wodonga students Rebekah O’Keefe and Paul Niklaus. The Environment and Sustainability in China Study Tour is an ongoing collaborative venture between the La Trobe University and CERES Global. Funding for this project was provided through the Australian Department of Foreign Affairs and Trade via a New Colombo Plan grant. The governance of China is one of the greatest social engineering projects ever undertaken. China’s monumental environmental problems are combining with significant social and economic forces that are reshaping Chinese society. Less well known in Australia is that China is a world leader in addressing environmental degradation. There is much we can learn from China about what to and what not to do in making our own communities sustainable. In China, our students grappled with the difficult question of how to live sustainably in a society that is inherently unsustainable. The ecological contradictions of China’s rapid economic growth model are well-documented. By experiencing this first-hand, Rebekah, Paul and the group were able to reflect on their own sustainability practices, both as visitors in China and in their lives back home. Rebekah O’Keefe making a presentation at Peking University, 2015. Paul Niklaus making a presentation at Peking University. After returning to Australia, the students completed a short video assignment documenting their learnings from our engagements with host organisation in Shanghai and Beijing, which we showcased at a movie screening evening at La Trobe University on Friday 14th July. Paul Niklaus focussed his video project on the Institute for Public and Environmental Affairs in Beijing, an NGO which works on politically-sensitive information transparency programs to improve monitoring of environmental pollution in China. Rebekah O’Keefe focussed her video presentation on two Shanghai-based NGO’s: Sprout Lifestyle and the Joint US-China Collaboration on Clean Energy. These two organisations conduct projects which spread awareness of pollution in China’s food system, support Chinese organic producers and improve the food literacy of Shanghai’s urban youth. Paul and Rebekah were able to build their personal resilience in a challenging cultural environment, further develop their critical analysis skills through research and field experience, and develop greater self-awareness of their own sustainability practice through reflection on their Chinese experience. I am immensely proud of Rebekah and Paul for their achievements in China. They were wonderful travel companions, thoughtful intellectual sparring partners and now emerging community leaders in sustainability practice.